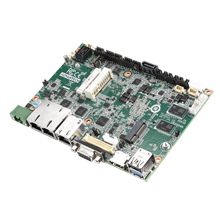 Advantech, a leading embedded computing and intelligent applications provider, today announces the release of MIO-5850, a new domain focused 3.5” fanless SBC that supports 4th Generation Intel Celeron® J1900 and Atom E3800 series low power consumption processors with 10W~12W TDP. MIO-5850 is designed with 2GB/4GB of onboard memory and anti-vibration eMMC storage. Three GbE ports, CAN bus with isolation and 12-24v power make this SBC ideal for domain focused applications in industrial automation, transportation, and outdoor self-service kiosks. MIO-5850 comes bundled with Advantech’s exclusive iManager 3.0 utilities and WISE-PaaS/RMM cloud ready solution for remote device management that brings the benefits of cloud computing within the reach of many embedded application developers. MIO-5850 is designed to fulfill a variety of vertical application needs and adopts a rich array of I/O interface including: 3 GbE ports, 1 x CAN Bus with 15KV isolation, 1 x USB3.0, 5 x USB2.0, 4 x COM ports, and 16-bit GPIO. For extra expansion, MIO-5850 supports 1 x full-size miniPCIe, 1 x mSATA, and an optional M.2 E-key. These allow various peripheral modules like WiFi, 3G/LTE, and additional storage to expand functionality. MIO-5850 can operate under wide temperature settings ranging from -40~85°C, making it an ideal solution for use in rugged and harsh environments such as factory automation, railways, outdoor signage, and kiosks (wide temperature SKU scheduled to phase in Sept. 2018). Advantech has just launched a new real-time equipment control solution called SRP-E2i140, which uses MIO-5850 with automation I/O including Ethernet and CANbus, and RDCAT software to build a real-time manufacturing environment. SRP-E2i140 incorporates different industrial fieldbus and peripheral drivers under Windows 7~10, and provides WISE-PaaS/EnSaaS, an industrial cloud service driving productivity and efficiency. SRP-E2i140 enhances the efficiency of automation equipment management by moving automation equipment management tasks from a single platform operation to a cloud-based operation. MIO-5850 is noteworthy for its combination with Advantech’s WISE-PaaS/RMM solution and iManager 3.0. WISE-PaaS/RMM is part of Advantech’s WISE-PaaS cloud solution, which provides centralized management features including HW/SW status monitoring, remote control, and system backup/recovery. It supports server redundancy and hierarchical server management, which increases service reliability and availability and helps customers to transform their business by incorporating powerful IoT cloud services. In addition, Advantech iManager 3.0, an intelligent self-management firmware agent, is a built-in solution chip with a standardized API that integrates several unique platform consolidating functions needed by embedded system integrators to help improve consistency, lighten development efforts, and speed up product time-to-market.